The first step in overcoming ecstasy addiction is generally detoxification of the drug from the user’s system. The name “ecstasy” is the most popular term for the drug methylenedioxy-methamphetamine. However, this drug is also often referred to as Molly due to its powdery white appearance that can be taken orally via capsule. Ecstasy is popular due to its potent ability to act as both a hallucinogenic and a stimulant, causing its users to experience bursts of energy, euphoria, hallucinations, and feelings of happiness and warmth. What happens when you take Ecstasy? Ecstasy is unlike any other hard drug currently available in that it heightens the users feelings of love, sexual arousal, and feelings of empathy. Typically, users explain an ecstasy high as an experience of feeling “overwhelming love” for everyone and everything. Users also report seeing hallucinations. With its ability to make its users feel good, it doesn’t take much of a stretch to see why ecstasy addiction occurs. When ecstasy is used it causes the brain to overload on dopamine, serotonin, and norepinephrine. These are the chemicals that play a direct role when it comes to our ability to experience pleasure, happiness and reducing anxiety and depression. Unfortunately, once the high has subsided, the brain will compensate by producing less of these chemicals. As a result, users will experience heightened feelings of confusion, anxiety, depression, insomnia, and cravings for more of the drug. The more ecstasy is used, the longer the detrimental side effects tend to last and the more likely ecstasy addiction will occur. Ecstasy in combination with ice or speed – Anxiety can peak severely, and brain functions may slow down due to a depletion in dopamine. This combination of drugs can potentially put a massive strain on vital parts of the body (such as the heart) and can cause the user to experience a stroke. Ecstasy in combination with alcohol – Can cause the user to become severely dehydrated and may even lead to them drinking too much water, which could lead to death. Ecstasy in combination with antidepressants – Users may experience dizziness, clumsiness, drowsiness, restlessness, and feelings of drunkenness. Even a single use of ecstasy may lead to a severe craving for more of the drug. However, long-term use will acclimate your body to the use of the drug and will make it that much harder to move on when you decide to quit. Keep in mind that quitting is difficult, but possible. Most withdrawal symptoms will either disappear or at the very least become less severe in about a week or so. Generally speaking, most users are completely symptom-free within the space of a month. However, long-term withdrawal symptoms may persist. 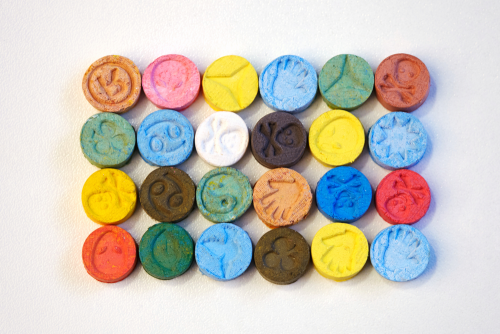 Ecstasy addiction should be treated as early on as possible. It is not advisable to allow yourself or a loved one to hit rock bottom before starting treatment. If you, a family member or a close friend are suffering from ecstasy addiction, act now! Ecstasy is often used in party scenes such as raves and other like parties and may seem like the “cool” thing to do at the time, but the sad reality is that it can ruin your life if you let it. If you’re dealing with an ecstasy addiction, reach out to us today. We can help you get the help you need to beat your addiction and move forward with your life. Give us a call today in complete confidence for free help and advice on helping addiction sufferers into treatment. People often mix ecstasy/MDMA and alcohol because they think it enhances the effects on physical performance, but this is simply not true. Others combine them because it can make the euphoric effects of ecstasy last longer. However, once the neurotransmitters are depleted, and the euphoria wears off, it results in a “crash.” “Crashing” after an ecstasy and alcohol combination high can result in anxiety, trouble sleeping and depression.